I believe my dad and you have been corresponding regarding his search for a 1974 450 Maico, and our family's motocrossing days in the early 70's. As you know, after an exhaustive search he finally located 1974 450 Maico with the help of Eric Cook of Maico Only, who restored the bike to perfection for my 39th birthday. I honestly didn't think these old bikes existed anymore. 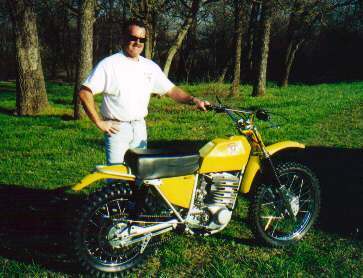 I enclose a picture of my Maico and its proud owner. To say I'm proud of it is quite an understatement. Dad thought you might like a little bit of background about my teenage exploits on the bike. Dad was involved in dirt biking in the late 60's running enduros on OSSA Pioneers. I started riding dirt bikes about the same time. My Honda Trail 70 gave way to a DT1OO Yamaha, and in turn to my first real bike, a Penton Six Days 125. By age 12 I had learned to ride that bike pretty fast, and about the same time my friends started racing motocross. In an effort to bring me out of some very bookwormish tendencies, dad encouraged I give it a try. Unfortunately, I dropped the transmission in my Penton shortly before the race, so my dad put me on his Husquvarna 450 Desertmaster. It was quite a handful at age 12, but I got fourth in a mud race and my racing career had started. 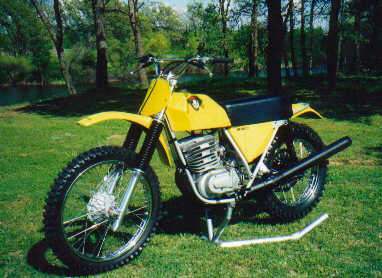 The 125 Penton was succeeded by a 250 Honda Elsinore. Although I had some degree of success running the Elsinore in amateur classes, I never could break through and really dominate. Apparently dad decided it was time to retool. Shortly after my 13th birthday, dad surprised me with something "new and different" to race. I walked into the garage, and there it was, the one and only Mighty 450 Maico. Wow I. While I was big for my age, the bike seemed huge. Unlike other motocrossers of the today, it was boxy and looked extremely odd, nothing like the sleek Suzuki TMs, Yamaha YZs, Husky cr's, etc. When I first rode the big 450 it seemed even more odd, particularly after my previous quick revving, quick steering, smaller displacement bikes. It was quiet through it's US- legal bazooka pipe. The big glass tank rumbled. The front end was heavy and it didn't want to pull wheelies. It steered slow, and felt like it was on rails. If it had a powerband, I couldn't find it; it just wasn't much fun to ride. I was disappointed and told my dad I didn't think it would be much of a racing bike. Boy, was I wrong. staging area, the other open class riders, all in their twenties and thirties, on a variety of Japanese machinery, looked at the big Maico and the kid on it with expressions ranging from curiosity to amusement. Their attitudes would change. I got the holeshot by a good fifteen to twenty yards. Darn, wasn't the bike a heck of a lot faster than it seemed! In the first corner, I dove to the inside line, and of course the front end did not wash out like everything else of the day, and as I blasted out of the first corner the front end did not come up unexpectedly either; I guess that heavy front end worked pretty good too. Through the whoops and the jumps the ungainly- looking Maico front forks and the wimpy looking girlings at the rear worked great; combined with the stiff frame and proper geometry the Maico's stability and handling were simply in a different league. I won going away. The recipe for my future campaigns on the big 450 was set: Out drag everyone to the first corner, out steer them, out drag them to the next corner, out steer them, etc., and then win going away. If I somehow feel asleep and missed the hole shot or fell down, passing was a cinch. Dive under your opposition without fear that the front end would wash, no matter the surface, and dial in full throttle and out run them to the next corner. There was simply nothing of the day that would stay with it. I lost two races in two years on the bike, one of them when I blew the engine and the second when some old guy (in his thirties) tried to dive underneath me on a 400 Yamaha and took me out when he could not hold the inside line. It was pretty cool telling the girls back in eighth grade class that I broke my ankle motocrossing. My last race was on my dad's play bike, an older obsolete 360 Bultaco Pursang, pressed into service while the Maico was in overhaul. I won, but it was real close, unlike my wins on the Maico. Although I quit actively racing after I got involved in school sports, I had always remembered the mighty 450 Maico and the infusion of confidence it gave me in my early years.. .as I mopped up all the older guys in the open class out here in middle America. Thank gosh there was no other Maicos out here. As you can see, my like new 450 Maico has been restored to original utilizing new old stock parts. Eric Cook of Maico Only disassembled a core bike down to component parts, and restored it to absolute perfection in every way. Pictures do not do it justice. Those guys at Maico Only are real craftsman. It is stone stock but for a dynamically balanced crank and a bronze swing arm bushing. Although it is really just too nice to race, I have been reading up on some of the amateur's exploits in the ~ I just can't help but wonder whether I really still have it. One thing is for sure, the Mighty 450 Maico still does. Maybe if I just intensify my workouts a little, lose some weight, start working those forearms, I sure hope my wife doesn't read this web page.